GI Joe celebrated his 50th birthday in 2014 having been released in 1964. 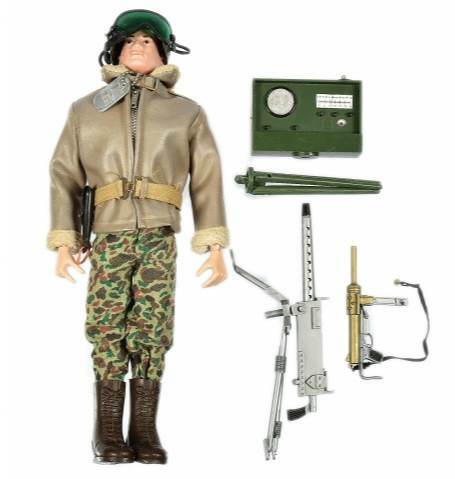 The GI Joe line action figures, produced by the Hasbro toy company has become one of the best selling and most collected toys of all time, spawning comics, tv series, films, books and a wealth of related merchandise. The Most Expensive Toy Ever (so far) The 1964 Original Hasbro prototype G. I. Joe (pictured right) is the most expensive toy ever sold selling for $200,000 in 2003. Heritage Auctions sold the then 40-year old, handcrafted prototype GI JOE to Baltimore business executive Stephen A. Geppi on behalf of one of the famous toy’s designers, Don Levine. The initial product offering represented four of the branches of the U.S. armed forces with the Action Soldier (U.S. Army), Action Sailor (U.S. Navy), Action Pilot (USAF), Action Marine (USMC) and later on, the Action Nurse. The term G.I. stands for Government Issued and became a generic term for U.S. soldiers (predating the action figures), especially ground forces. 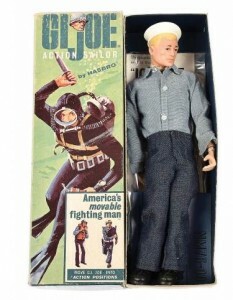 The development of GI Joe led to the coining of the term “action figure”. GI Joe’s appeal to children have made it somewhat of an American icon among toys. The G.I. Joe trademark has been used by Hasbro to title two different toy lines. The original 12-inch line that began in 1964 centered on realistic action figures. 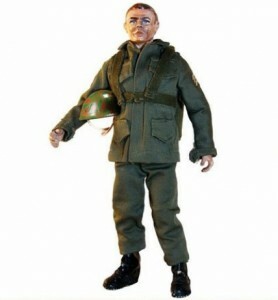 In the United Kingdom, this line was licensed to Palitoy and known as Action Man. In 1982, the line was relaunched in a 3¾-inch scale complete with vehicles, playsets, and a complex background story involving an ongoing struggle between the G.I. Joe Team and the evil Cobra which seeks to take over the Free World through terrorism. As the American line evolved into the Real American Hero series, Action Man also changed, by using the same molds and being renamed as Action Force. Although the members of the GI Joe team are not superheroes, they all had expertise in areas such as martial arts, weapons and explosives. 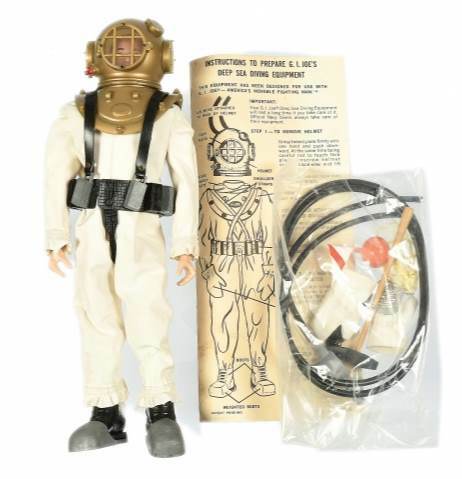 The conventional marketing wisdom of the early 1960s was that boys would not play with dolls, thus the word “doll” was never used by Hasbro or anyone involved in the development or marketing of G.I. Joe. “Action figure” was the only acceptable term, and has since become the generic description for any poseable doll intended for boys. 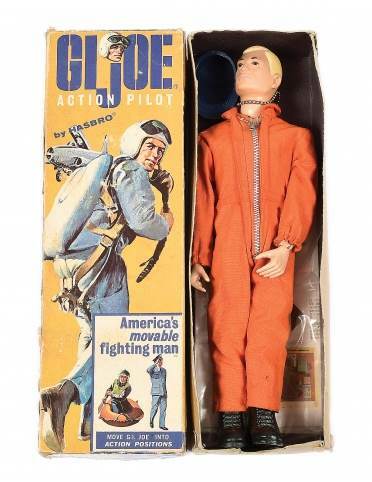 “America’s movable fighting man” is a registered trademark of Hasbro, and was prominently displayed on every boxed figure package. The Hasbro prototypes were originally named “Rocky” (marine/soldier) “Skip” (sailor) and “Ace” (pilot), before the more universal name G.I. Joe was adopted. One of the prototypes would later sell in a Heritage auction in 2003 for $200,001. Aside from the obvious trademarking on the right buttock, other aspects of the figure were copyrighted features that allowed Hasbro to successfully pursue cases against producers of cheap imitations, since the human figure itself cannot be copyrighted or trademarked. The scar on the right cheek was one; another, unintentional at first, was the placement of the right thumbnail on the underside of the thumb. Early trademarking, with “G.I. Joe™”, was used through some point in 1965; the markings changed once G.I. Joe was a registered trademark; “G.I. Joe®” now appears on the first line. Subsequently, the stamped trademarking was altered after the patent was granted (in late 1966), and assigned a number; 3,277,602. Figures with this marking would have entered the retail market during 1967.